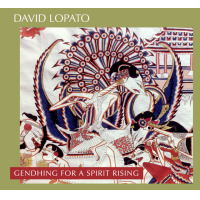 David Lopato's music reflects an involvement with such diverse forms as modern jazz, stride piano, avant-garde classical music, blues, latin and various world musics, most notably those of Indonesia, where he has lived and studied Javanese gamelan. His love of these seemingly disparate traditions has resulted in a body of music that is both universal and personal. Although his main instrument is piano, his interest in other, more exotic timbres has led him to explore new techniques for preparing the piano, as well as incorporate other percussion instruments and electronics into his work. He has worked extensively with computers, MIDI, and related digital media to facilitate the creation and realization of his own music and that of other musicians. In 2002, his performance repertoire expanded into the theatrical realm with the debut of his first full-length monologue Small Matters of Life and Death. In 2009, he ventured further outside the musical realm with the authoring of his first book, Take Alternate Routes, a memoir about marriage, infertility, adoption and the raising of a special needs child. David Lopato was born in 1954 in Brooklyn, NY. His studies include a B.A. in music composition from Yale University, graduate work in African drumming at California Institute of the Arts and Javanese gamelan at Akademie Seni Krawitan Indonesia in Surakarta, Java as a Fulbright Scholar. He has performed his own compositions throughout the world as a soloist, leader of his own trio, quintet and ten-piece ensembles. Major venues which have presented performances of his music include Westdeutsche Rundfunk, Netherlands National Radio, Radio France, National Public Radio, De Singel, Stedelijk Museum, The Kroller-Muller Museum, The Museum of Modern Art, The Kitchen Center, Symphony Space and The Vancouver Jazz Festival. As a pianist he has worked with Ray Anderson, Dave Liebman, Joe Lovano, Mark Helias, Jane Ira Bloom, Gerry Hemingway, David Mott, Wadada Leo Smith, Steve Gorn and Steve Reich. He has received much recognition as a composer, having been awarded several grants from the National Endowment for the Arts for both jazz and classical music. In addition, he has received grants from the New York State Council on the Arts, The New York Foundation for the Arts, The Beards Fund and numerous grants from Meet The Composer. Recordings as a leader include Giant Mbira, Inside/Outside, The Standard Line (with David Mott), and Many Moons. Gending For a Spirit Rising, a large ensemble recording of gamelan-influenced music is scheduled for release on Sept. 8. Lopato has also written music for television, film and commercials, scores for dance and theatre companies, and collaborations with poet Ruth Danon and the Dutch artist Roland Schimmel. Their collaboration Blind Spot for computer-generated animation and audio was presented at the 2005 Kleurbeurs Exhibitiion at the Beurs van Berlage in Amsterdam. His expertise in the realm of MIDI programming has enhanced recording projects for such clients as Sony Classical and Daichi Kosho Japan. From 1990-2010 he was the producer of the concert series at InHouse, a performance space in downtown Manhattan devoted to modern improvised music. Since 1991, he has been on the faculty of the Jazz and Contemporary Music Department of the New School University in New York City where he has taught courses ranging from music theory, composition, and ear training to film scoring and the use of computer technology in music. He also taught on the faculty of Montclair State University from 2007-2013 where he lectured on world music history and jazz history. 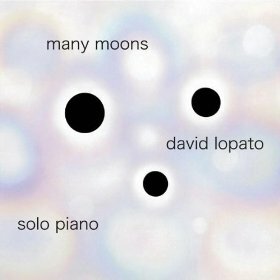 David Lopato, Solo Piano, "Many Moons"
All About Jazz musician pages are maintained by musicians, publicists and trusted members like you. Interested? Tell us why you would like to improve the David Lopato musician page.